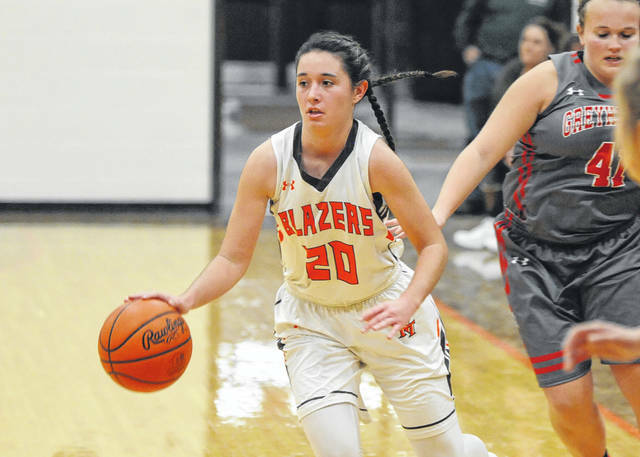 National Trail freshman Skylar Ward scored a team-high 19 points in her varsity debut to lead the Blazers to a 54-34 win over Dixie on Tuesday, Nov. 27. NEW PARIS — If James Byrd was worried about his team and the first game jitters it didn’t show – although he admitted afterwards he was a “little nervous” before the game tipped off. 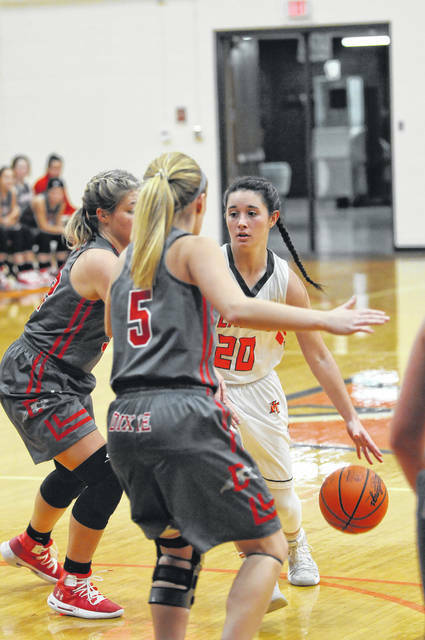 Making his debut as National Trail’s girls basketball coach, Byrd saw his team jump out to an early lead over visiting Dixie then cruise to a 54-34 home win on Tuesday, Nov. 27. “I thought it was a good first game for us. Got those first game jitters out of the way. I thought our effort was good. I think our focus was good throughout the game,” he said. Four different players scored in the first eight minutes of the game as Trail took a 10-4 lead and never looked back. The Blazers extended the lead to as many as 12 in the second quarter, 24-12, and led by nine at the break, 25-16. Trail upped its lead to 38-24 after three and pushed the lead to as many as 22 late in the fourth quarter. Freshman Skylar Ward led all scorers with 19 points, with 12 coming in the second half. Senior Evan Byrd added eight points as did junior Makena Laird. 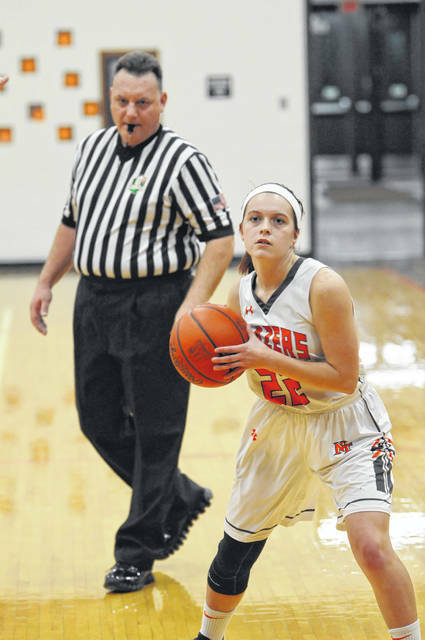 Senior Savanna Abner chipped in six, all in the first half, from her point guard spot. Coach Byrd said his team showed some nerves early on, but eventually settled in. “The first game, they were pretty nervous before it so it was good to get it out of the way,” he said. He added there are a few things he wants his team to work on. “We want to stay clean and make each possession count. Don’t just throw a pass because we’re supposed to throw a pass. Make sure you’re making the right play. Live to shoot another shot,” he said. 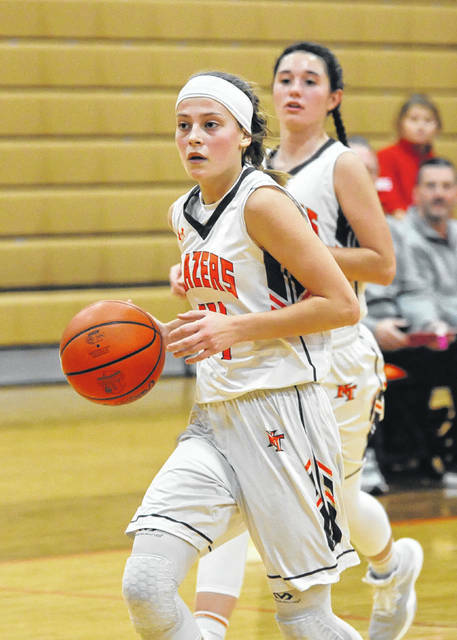 On Thursday, Nov. 29, the Blazers traveled to Miami East for their Cross County Conference opener. Trail was limited to just two points in the third quarter in a 42-24 setback. Laird had eight points to lead Trail, who was behind 11-6 and after one and 23-11 at the half. East led 34-13 after three. “Defensively we were really strong but could not capitalize on the looks we got offensively,” Coach Byrd said. 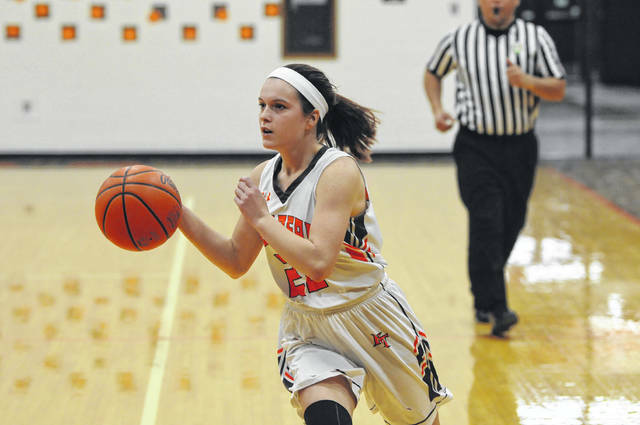 On Saturday, Trail suffered its second straight loss, 48-43, to Northeastern (Ind.). The Blazers (1-2, 0-1 CCC) was scheduled to host Cambridge City (Ind.) 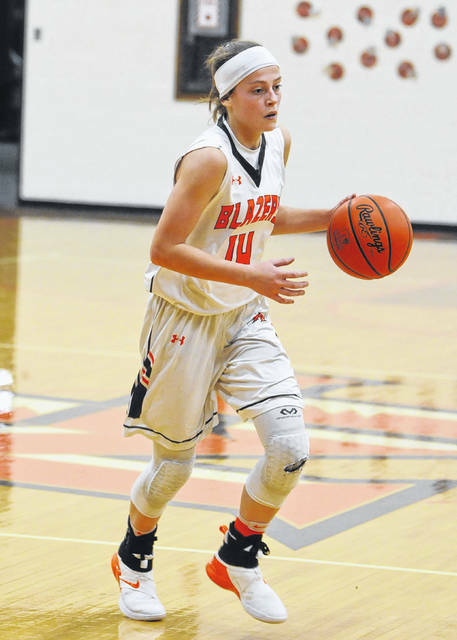 Lincoln on Tuesday, Dec. 4 and will play at Stivers on Saturday, Dec. 8.
https://www.registerherald.com/wp-content/uploads/sites/41/2018/12/web1_ntgbk1.jpgNational Trail freshman Skylar Ward scored a team-high 19 points in her varsity debut to lead the Blazers to a 54-34 win over Dixie on Tuesday, Nov. 27.